The recent deluge in Mumbai evoked different reactions from Mumbaikars as well as other parts of India- fear, caution, and disdain over the apathetic state of infrastructure and so on. But overriding all these emotions was a bitter nostalgia of 26th July, 2005 when the city went down under to such as scale for the first time. Little did people know that something similar would happen 12 years later? Such unpredictable and sudden catastrophes have created to an overarching fear of nature, owing to its uncertain and whimsical behaviour. But seldom do we realize that this state of the financial capital (and other places) is our very own doing- reclaimed lands, encroached rivers and forests, and little breathing space for the once controlled seas has unleashed nature’s fury. We have now reached a state where we need to turn to nature, to save nature herself. Maybe it is too late, but maybe there is still a sliver of hope to preventing the maximum city from becoming a victim of its own doings. And this hope lies in the most unique but now fast disappearing treasure trove that Mumbai possesses- her mangroves. Mangroves are plants that survive high salinity tidal regimes, strong wind velocity, high temperature and muddy anaerobic soil – a combination of conditions hostile for other plants. They are found in the inter-tidal zones of shores, estuaries, creeks, backwaters, lagoons, marshes and mud-flats. The coastline of India has around 4,628 square kilometre of mangrove area and recently 112 square km were added. 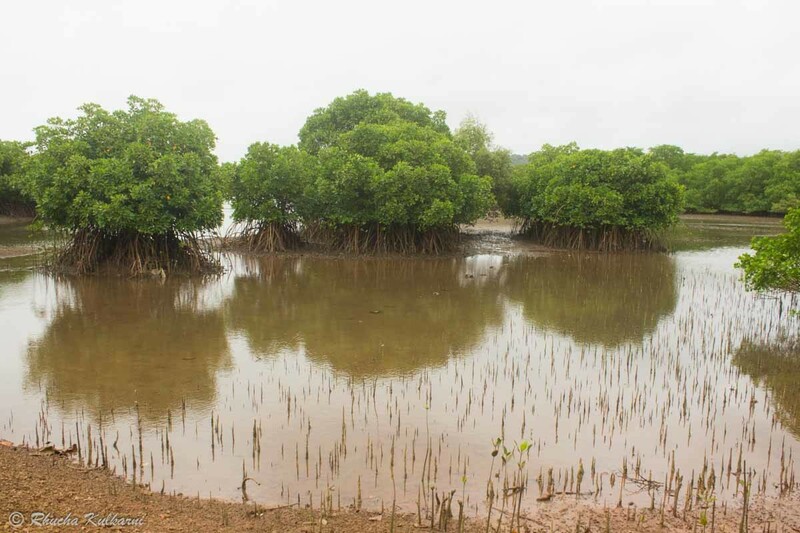 While mangrove presence is reported from all coastal states of India, three districts have registered good growth including Krishna district, Andaman and Nicobar Islands and Raigarh district, each adding around 15 square kilometre mangroves. West Bengal has the highest mangrove cover in the country. Mangroves across India constitute a total of about 59 species, a few common ones being Rhizophora apiculata (Red Mangrove), Rhizophora mucronata (Red Mangrove), Bruguiera gymnorhiza (Broad leaf orange mangrove), and Sonneratia alba (Mangrove Apple) etc. 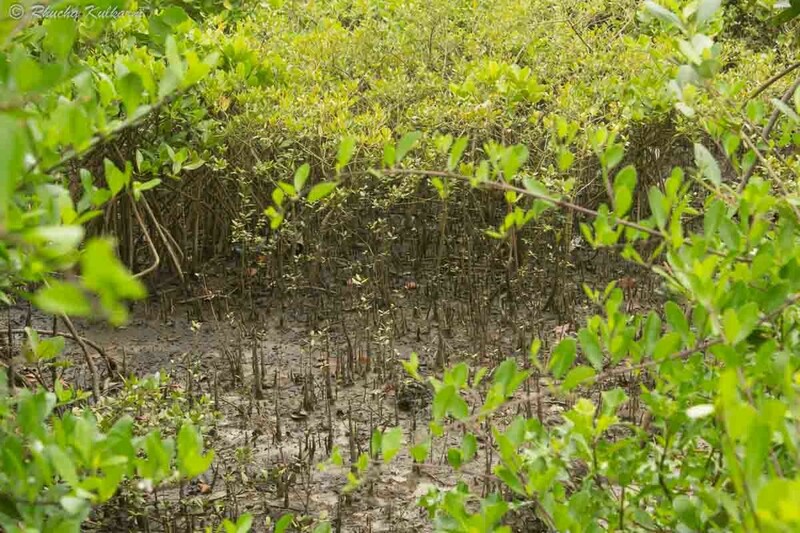 Nutrient Recycling: Mangroves are full of organic rich sediments with the capability to lock up carbon due to low oxygen conditions in submerged water. They can hence act as carbon emissions controlling elements near urban areas, reducing the climate change impact. Ground Water Recharge: Water levels are maintained by mangroves, stabilizing the ground water table. Habitat and Food chain Support: The unique ecosystem of mangroves provides subsistence to peculiar plants and animals. Amongst animals a variety of zooplankton, insects, butterflies and moths, molluscs and crustaceans, reptiles, birds and mammals make their homes. In fact a total of 105 species of fish call mangroves their home. The Sunderbans mangroves are ideal habitat for the apex predator of India, the tiger. Mangroves are thus a critical biodiversity habitat essential for the animate and inanimate natural elements to thrive and hold together the man-made and natural world in a balanced state. You would have seen the vast patches of green that add a dash of colour to the concrete jungle that Mumbai is. We often look at these patches in disdain, regarding them as dirty muddy weeds growing pointlessly. After all they do not resemble the beautiful arches of a tall tree or the gentle agility of a lovely creeper! But it is these very mangroves that have retained whatever semblance of order and discipline that Mumbai city has left in her. Mumbai’s coastline is prone to erosion because it is primarily reclaimed land, battered by the sea on all three sides. There was a time when the Mithi River and Mahim Creek was adorned by the green mangroves, acting as the physical barriers, saving Mumbai from the onslaught of the sea, as well as serving as a drainage basin for heavy rains. Alas, today these life-saving “forests” have been reduced to some areas of Vasai Creek, Thane Creek, Manori and Malad, Mahim – Bandra, Versova, Siwari, Mumbra – Diva and a few more places. Much of these mangroves (around 60%) constitute of the hardy tree which can bear saline water, the Avicennia marina. The robust nature of this tree allows it to not only withstand, but also help purify the megacity’s polluted air- smog, heavy metals and all. The spread out nature of the half-submerged aerial roots play a vital role in holding or binding together the Mumbai soils and reclaimed lands. Most importantly, the mangrove expanses used to act (and still do to the best of their ability) as a natural floodplain for rain and storm water to drain off. These green friends would soak up all the destructive excess water, and save our lives. And in return what did we do to them? Hack off their very souls for commercial purposes like housing development, commercial complexes, malls, roads and all things man-made. Pure destruction of nature for our selfish interests. And then we wonder why nature is making her voice heard in untoward ways like the recent Mumbai floods? In 2012, the Maharashtra State Government set up a Mangrove Cell for researching and conserving the species. The Cell has set up a mangrove nursery in Vasai Creek and planted 250,000 mangrove saplings in five locations in the city till date. It also works towards spreading awareness about mangroves being our friends and not filthy wastelands, by making them more accessible to people like you and me. Access is the first step to awareness, awareness is the precursor to appreciation and appreciation is a must for nature conservation. Spread the word about mangroves being friends and not foes, as they are misperceived. So the next time you frown down upon the neighbouring mangroves during your morning office drive, spare a thought for these heroic green friends. They are after all, the first citizens of this megacity, much before you and I arrived! Turn your frown to a smile, thank them for their selfless deeds of saving Mumbai from tide (quite literally!) and trials, and work towards helping them thrive!